"Who does God consider to be blessed?" As I began this journey and dug into the 222 references of who God considered to be "blessed", I started to ask more questions. What does the homeless person pray for? 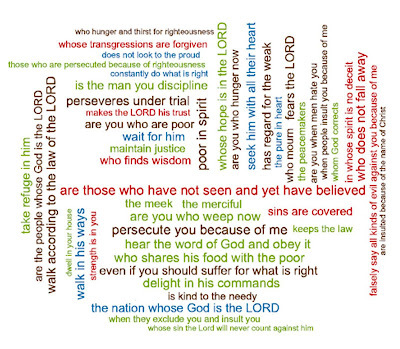 What does the hungry person ask of God? Do you think that they asking to be blessed? What prayers do the rich pray? Who are the rich? Am I rich? Who is considered to be wealthy? How do their prayers differ? I discovered that the worldwide median income is $9,875. Dang. I think I made that much when I was a Junior in High School! The median income in the United States is $44,155. Did you know that the United States owns 27.3% of the world's wealth and that the next closest country is Japan at 9%? To contrast that statement, the United States only accounts for 4.5% of the world's population. That means that less than 5% of the population of the world controls over 25% of the world's wealth. In real numbers, the US owns $13.2 trillion dollars and the top 10% of Americans control almost $4 trillion of that $13.2 trillion. I mention all of this to say, Americans are blessed with unbelievable wealth and resources. When I set out on my journey to discover who God considered to be blessed, I ended up discovering the immense amount of economic, technological and industrial blessing that we enjoy as citizens of the United States are, as the CIA says it, "the largest and most technologically powerful economy in the world." Now, there is a plague in America that is rotting the core message of Jesus. This plague tells us that if we choose to follow after Jesus and give our lives to Him that we will be healthy, have wealth and live in prosperity. Americans already HAVE all of that! Heck, I even saw a billboard for a church in Austin that read, "God's will for your life is perfect happiness." That makes a lot of sense, doesn't it? It's like is they're preaching the gospel according to America! But is that what Jesus REALLY taught us? Is that REALLY why Jesus died for me and you? This is 50 of the 222 references to "blessed" in the Bible. Not every reference was about God considering someone blessed. However, there are about 95 or so verses where God directly called someone or some people blessed. Now, I did find one reference to "riches" and it read like this, "A faithful man will be richly blessed, but one eager to get rich will not go unpunished." (Proverbs 28:20) So even this reference to being blessed is not monetary. My quest to discover who God considered blessed opened my eyes to the blessings that are already mine. I am a rich man. I have been born blessed. It really seems like God's reality is in stark contrast to our world, doesn't it? The weak, the poor, the suffering, the humble, those who choose God, those who believe in Jesus, those who endure trials, those who do what God asks, those who do what is right, those who fight for justice, those who give, those who mourn, those who seek God with their whole heart- they are blessed! They are the one's who inherit Heaven. They are the one's who are God's children. They are the one's who find joy and peace and fulfillment! Where does it say that we get wealth or health or prosperity or happiness? If God chooses to "bless" us with happiness or health or prosperity or wealth then it is for the purpose of using it for doing His work in this world. Now, I am not saying that we can't enjoy the good things that He gives us, because we can and we should. However, all of these good things are not the point. When we focus on getting more of the good things that God gives us instead of God, then we elevate the gifts above the Giver. What if for a moment we imagined a world where the rich gave to the poor and fed the hungry and used their wealth to help those in need? What if that was the point to why there were rich in the first place? What if for a moment we envisioned only 5% of the $13.2 trillion dollars in America going to help the other countries where people are dying from lack of good drinking water or curable sicknesses or malnourishment? I bet we could end most of that in the next five years! We could choose to bring Heaven to earth in a tangible way. Who wouldn't want to follow after a God whose followers acted like that?